To put it bluntly, I never thought I would read anything else by Terry Goodkind again. After my disastrous first attempt to get into The Sword of Truth series, I almost turned down the opportunity to read Death’s Mistress, but now I’m very glad I didn’t. It’s been years since I last read Wizard’s First Rule, and it seemed a shame to potentially miss out on a good start to a new series especially when the author’s style or my reading tastes could have changed so much since. And as things turned out, I did have a surprisingly good time with this. I also had initial concerns about jumping in without having read the entirety of the previous series, but that was not a problem. The book follows Nicci, a “Death’s Mistress” and a former lieutenant of Emperor Jagang who has since switched her alliance after being converted to the right side by Richard. Now that the latter has solidified his rule, Nicci travels the world helping spread the word of his benevolence and letting everyone know that the world is free, while accompanied by the ex-prophet and wizard Nathan. At the beginning of this story Nathan decides to seek out the witch called Red, and Nicci offers to go along with him for protection, knowing they can trust no one and must be prepared for anything. Sure enough, after their visit, the witch imparts upon them the following obscure message: travel to a dangerous place far away called Kol Adair, where Nathan will find the answers to his struggle with his waning magic. Little do Nicci and Nathan know, that by embarking on this adventure they will also be a part of something much bigger, bringing back peace and hope to many along the way. Indeed, before they can even set off in earnest, Nicci saves the life of a young sailor named Bannon on the docks, preventing him from being mugged and killed by a gang of thugs. Grateful for her help, Bannon offers his services to the Death’s Mistress, volunteering to fight alongside her and Nathan while on their journey to Kol Adair. I must confess, the story’s introduction was a bit of a whirlwind for me, with the bewildering circumstances around Red and her message, as well as the reasons for Nicci and Nathan to head to Kol Adair. It’s clear that I’ve missed a lot of history, not having followed The Sword of Truth. Trying to piece together everything that has happened since the last time I spent time in this world admittedly took up most of my attention, though fortunately once our characters actually begin their adventure, the path ahead gave way to clearer purposes and more exciting and engaging motifs. Death’s Mistress has a strong traditional fantasy vibe to it, with emphasis on the classic quest narrative. The question why Nicci, Nathan and Bannon were on this journey in the first place became less important to me overtime, while the details surrounding where they’ll go or what they’ll do when they get there or who they’ll meet gradually became more fascinating and relevant. If there’s a bigger story, it hardly matters—at least at this point. 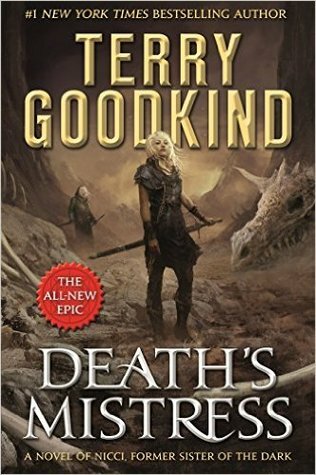 Goodkind is starting a new series here, and you can tell he’s doing his best to make Death’s Mistress as accessible as possible. There’s not much history or deep context in play, and no greater conflict to concern ourselves with…yet. Rather, our characters are given a relatively straight forward task (go to Kol Adair, spread the word of Richard’s reign) and while on their travels they encounter various situations in which they can lend a hand or help solve a problem (picking up some side-quests along the way, so to speak). In fact, the structure of the plot can almost be described as “episodic”, the way our adventuring party moves from one place to the next, setting things aright before moving on again to save the next village or help defend the next town. The results are surprisingly enjoyable. After all, few things are better than being able to explore new worlds, meet new people, and witness epic battles infused with a real sense of excitement and magic. If you’re a fantasy reader, these are the moments we live for, and this book had a way of satisfying all those little pleasures. From our time with our characters on the high seas, to watching them fight alongside a fishing village against a fleet of attacking slavers, to being with them as they try to save a land leeched of life, it’s never a dull moment with this book. The characters are also memorable, with Nicci being a strong protagonist I could sympathize with and root for. Supporting characters are also well-written and fleshed out, leading to some highly emotional and shocking surprises near the end. Like I said, I’m very glad I decided to give Death’s Mistress a chance. At times, Goodkind’s writing still has the subtlety of a cudgel and some of his scenes can be a little schmaltzy, but on the whole my experience was a lot better than I expected. Nothing too complicated here in terms of plot, but I think in this case, the straightforward and simple approach worked in the book’s favor, offering readers a chance to just sit back and enjoy the ride. I heard a lot about this author but I confess that I never tried one. Maybe one day. Maybe give this one a try if you ever do. I can’t really recommend Wizard’s First Rule. I got through the first seven books of The Sword of Truth series (I went back and checked) before quitting on the eighth. I don’t think I can give him another try. I’ll watch for your reviews of his new works. Maybe if he gets a few books into this new series, and his old flaws don’t creep back in I’ll consider it. Maybe. Wow, seven books! That’s farther than a lot of others I’ve heard. I just couldn’t get into his writing, but I also heard a lot of different things being cited as reasons why people quit. What were some of the flaws you found? In the end it was all the preaching Goodkind did. Every book was a sermon about some topic or political view. I know basically every book will have traces of the author’s views, and some are made to make you think, but Goodkind just beat you over the head with his. It was as if his story was only there to deliver these chapter long sermons. It got worse as the series went along until I just couldn’t keep reading. Ugh, that sounds awful. I hate preachiness in my books, I just want to read a good story and not have to put up with an author going on and on about his or her political or social views channeled through their fiction. Well, thanks for the heads up about that, I’m glad there wasn’t any of that in Death’s Mistress. I am with Jonathan though and will take a “wait and see” approach. It’s a smart approach 🙂 I hope the good vibes continue in the sequel! I almost DNF’ed Wizard’s First Rule. Sheer stubbornness forced me to continue, lol! But I won’t be reading the second novel. I also just can’t. Something about the protagonist unironically spreading the news of how good their land’s new supreme ruler is just seems a bit…off… these days. And Goodkind has now used the magic is dissapearing thing as a plot point at least three times. But like the poster above, maybe if the whole new series avoids long Randian rants then perhaps I will consider it after a few books. Come on, dude, give Richard a break, he doesn’t have Facebook or the media to do his bidding. Gotta spread the news the old fashioned way, by Death Mistress. Can’t say I’ve ever read a Goodkind book, which kind of surprises me. I probably have one on my shelves somewhere, though! I think most fantasy readers will have something by him on their shelves 😀 No matter how people feel about his SoT, can’t deny it was pretty huge! So glad you enjoyed this! It seems there are a lot of us wary of Goodkind. I’ve only read one book by him, and I’m not sure I’ll try another. Unlike most I greatly enjoyed the SoT series for the most part. I will admit that books 5, 7 & 8 were definitely the lowlight of the series which is where I think most people give up? That said, the conclusion arc was fantastic..encompassing books 9, 10 and 11. Then Goodkind went on to add more books and wring the life out of any pleasure I had in his characters! This one will be another pass for me. Thanks for another take of the series! I hadn’t realized he wrote more books even after the SoT series concluded – I can see how that can be overkill, lol. Yay! I’m glad this book was good. I actually read the entire first series, but when he restarted it I just couldn’t get into them. It felt like it wasn’t really what he wanted to write anymore. Nicci has always been my favorite character though so I really wanted this one to be good! (I so don’t remember who Nathan was haha) I’m glad that she’s finally getting her own series! It’s funny how a comment above said almost the exact same thing! I guess some authors just don’t know when to quit! I didn’t even though he attempted to restart after SoT was completed! Haha that is funny! Yeah he tried writing another book but it flopped, so he started SoT up again. My sister read them all and convinced me not to bother. I too struggled with Wizard’s First Rule and then proceeded to struggle with the next 3 because I thought the Mord’Sith were cool. I cringe and get facial twitches if I think about the experience too deeply because the friendship theme was overwhelming. I probably won’t get around to this one, but I’m glad to see you enjoyed it!! Never read this author – maybe this should be the starting point as there seems to be a lot of mixed feelings for some of his other work! Wow, I have to admit being surprised you enjoyed it so much, as your past experience with Goodkind was not pleasant, but it is good to know there might be some hope with this series after all. Thanks for the great review! I was surprised how much I enjoyed it too. I still groan whenever I think back to my experience with Wizard’s First Rule. It’s really amazing what a complete 180 this was. I’m glad to see you reviewed it positively. I actually liked the sword of truth series, but ended up DNFing his first Richard and Kahlan book because of the senseless repetition and back and forth dialogue. It was insufferable. I haven’t decided if I want to read anything else by him, but your positive review just inched me a tiny bit closer to yes haha. Ooh, I see! Well, I really appreciated her review then haha. And I would love to see one from you, although you’re so up on new releases, I don’t know how you could ever find the time to write one!